As muesli eaters are keen to remind us, ‘Today is the first day of the rest of your life’ – in my case ‘Today was the first day of the rest of the great 6 month cassette experiment’. With the weight of potential history weighing heavily upon my shoulders I cleared all evidence of CDs from my car (frighteningly there were 34 of them in there!) 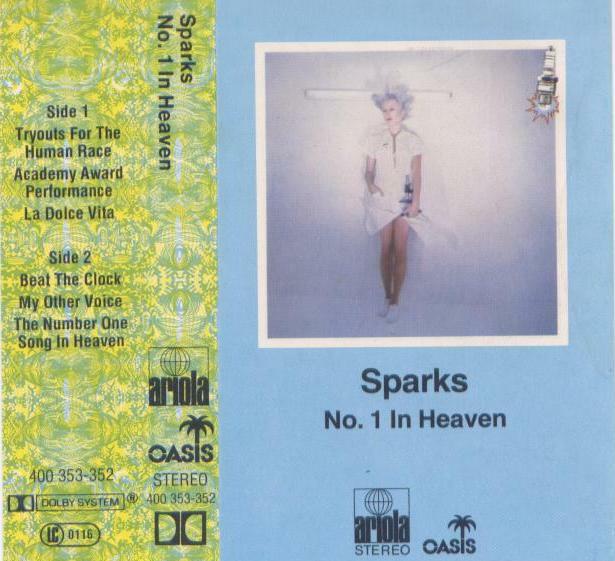 and chose my first cassette. Now not all of my tapes are of the same musical high quality, but I thought that for day one it was important to choose a really, really good one. 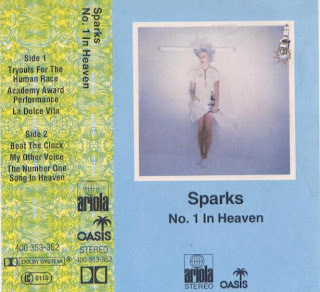 As if 34 was the theme of the day I chose one that just happened to be 34 years old – Sparks’ ‘No. 1 in Heaven’. A brilliant electronic pop album (I have an unproven theory that many of the best electronic albums were made in the 70s rather than the 80s) with Giorgio Moroder’s influence ‘front and centre’. It’s a six track album too and for some reason that’s always good news. Not all of the tracks are fantastic, it dips a bit on ‘My other voice’ for example, but for my money the whole album builds towards the ‘goosebump moment’ when, halfway through the final and almost title track ‘The Number One Song In Heaven’, the tempo shifts and Giorgio, in near ‘I feel love’ mode finally pulls out all of the stops and the album races headlong to finish, as all tapes do, with the familiar hiss of the run-out. I always picture a disco in heaven when I hear this song, with departed DJs playing this track – although as we’ve recently found out, not all DJs go to heaven. If you enjoyed this post (and I really hope you did) then you can read about the whole six months on your Kindle. Simply search for 'The Great Cassette Experiment - The Joy of Cassettes' by Neil Pace. Thank you.